I have really wanted to spend more time making things this last year. Pottery, prayer flags, polenta cake—anything that lets me get messy, be creative, and share. In part, this renewed passion is a return to the kind of activities that filled me with joy when I was a child but it's also a way of creating the conditions for the kind of active, engaged person I want to continue to grow into. 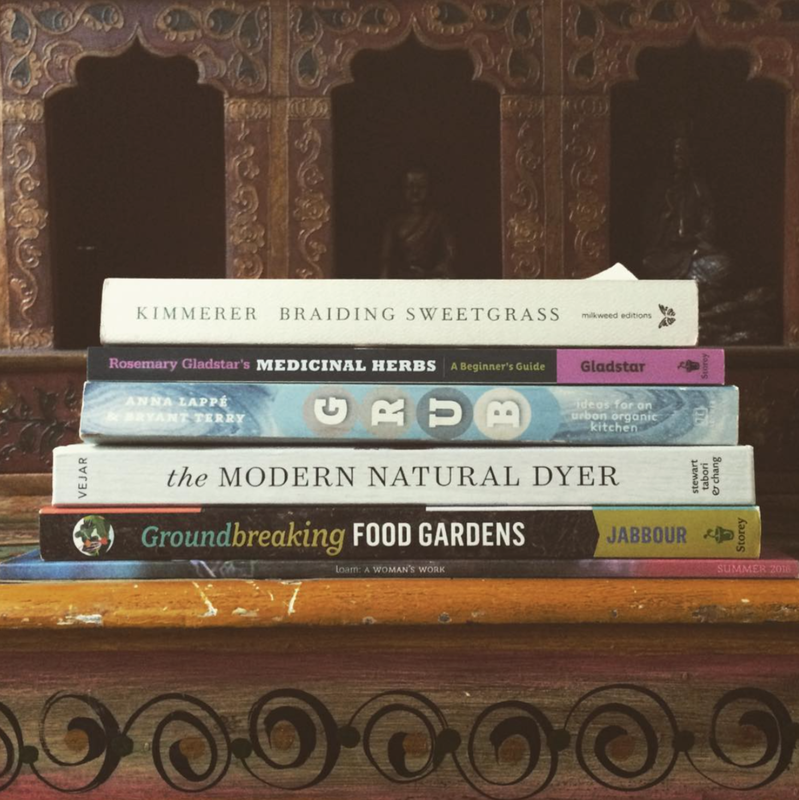 The following five books have been cherished companions of mine on my journey of turning all this esoteric dreaming into grounded-in-reality doing. I hope you enjoy and be sure to share your own favorite reads in the comments! "Braiding Sweetgrass" has changed my life. Robin Wall Kimmerer is both a plant botanist and a soul stirring poet. Her book is a call to action against the capitalist systems that accelerate climate change but it's also a joyous celebration of the million and one things that make our life on earth so precious. After taking an Abundance Workshop at Dig In Farm with my mother, my desire to explore the magical world of medicinal herbs deepened. This beginner's guide will provide you with the know-how to make your own salves, herbs, and solar-infused teas. I salvaged this book from a free book store in Bolinas and it's traveled with me since. This thoughtful, engaging ode to small planet eating is grounded in hard science and rich in yummy recipes. This gorgeous guide to natural dyeing has become a beloved companion of mine as I dip my toes into radical homemaking. Vejar merges a breakdown of the process with project ideas that will leave you eager to sift through the weeds outside your door and inspired to work with what you have. I love learning about all the cool ways that gardeners are growing green. "Groundbreaking Food Gardens" brings you behind-the-scenes with urban agriculturists, plant mamas, and backyard botanists who are working in a diversity of conditions to nurture their own Edens.